We are proud to state that our Advanced Neonatal & Paediatric Tertiary Care Centre provides the best paediatric treatment facilities in Kochi. Treating a child with an illness is not the same as treating an adult, as it requires specialized care and a different degree of understanding. Unlike adults, children cannot always say what is bothering them nor can often provide reliable answers to medical questions. It is also difficult to medically examine an infant or a child as they tend to be restive and probably not co-operative during the process. The Paediatrics & Neonatology department comprises of a team of well-qualified specialists and support staff specially trained in delivering neonatal & paediatric patient care. This is complemented by excellent support from other multidisciplinary specialist departments, when required, especially in life threatening emergencies. 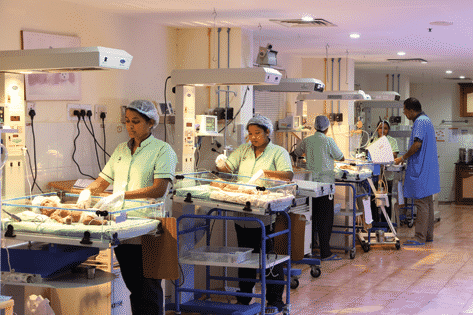 The availability of an in-house Level III Neonatal ICU and surgical facilities that provide 24 x7 service, EMC is a front runner in providing the best comprehensive paediatric healthcare in Kochi and has earned the status of a referral unit in the region.